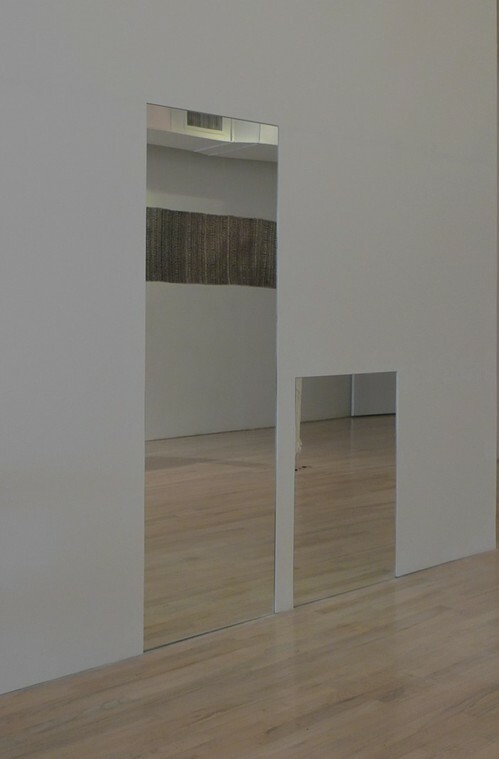 For “Untitled” (Orpheus, Twice), 2012, Greg Allen alters Felix Gonzalez-Torres’ elegiac 1991 work, cutting one of the pair of identical, adult-sized mirrors down to a toddler’s height. In Gonzalez-Torres’ original conception, the work’s evocation of the musician of Greek myth who travels to Hades in hope of bringing his beloved Eurydice back from the dead, has been understood as a reference to the artist’s own partner Ross Laycock, who had just died from AIDS-related illnesses. Former MoMA curator Rob Storr has also noted a formal resonance between Felix’s piece and Jean Cocteau’s 1950 film version of Orpheus, set in postwar France, in which a bedroom mirror becomes the mourning hero’s gateway to the underworld. By transmuting the twinned mirrors’ allusions from lovers to parent and child, Allen’s simple gesture renews and expands the senses of personal loss and political outrage of Gonzalez-Torres’ original. By faithfully preserving the rest of the work, including the title, “Untitled” (Orpheus, Twice) marks the ground traversed in the intervening decades; from a fight for survival against homophobia and the AIDS epidemic to marriage equality and gay dads. Changes Felix might have taken measure of himself, if only he were still here.